George Selwyn Stone was born in 1828 in Chetnole, Dorset, the son of William Stone and his wife Lucy. William Stone was a cordwainer of Sherborne who, in 1851, was employing three men and an apprentice. George had attended the Normal College, Cheltenham and in 1851 he was lodging at Eglwysilan, Glamorgan, Wales where he gave his occupation as National Schoolmaster. He later became, for a year or two, an English master at the Classical & Commercial School in Winchester. During the 1850s George returned to Yeovil and set up his own Commercial School in Wine Street. As seen in the advertisements below, George's comprehensive course of instruction included "Reading & elocution, writing, book-keeping, arithmetic, Euclid, mensuration (including land measuring), English grammar, analysis & composition, geography, English history, the elements of astronomy, physical science, Latin, French & drawing". Whether or not George taught all the subjects himself is not known. 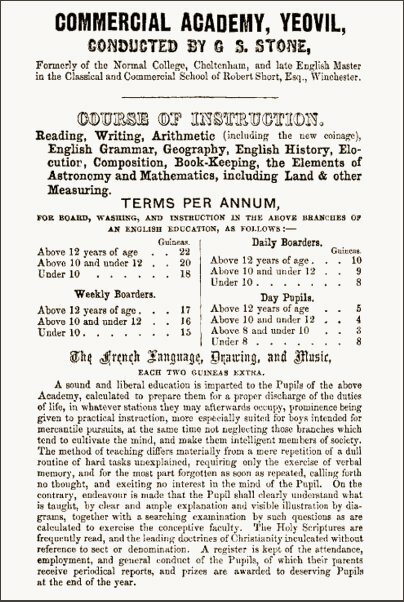 Of particular interest, in the second advertisement below, is outlined George Stone's educational ethos in which he described "A sound and liberal education is imparted to the Pupils of the above Academy, calculated to prepare them for a proper discharge of the duties of life, in whatever stations they may afterwards occupy, prominence being given to practical instruction, more especially suited for boys intended for mercantile pursuits, at the same time not neglecting those branches which tend to cultivate the mind, and make them intelligent members of society. The method of teaching differs materially from mere repetition of a dull routine of hard tasks unexplained, requiring only the exercise of verbal memory, and for the most part forgotten as soon as repeated, calling forth no thought, and exciting no interest in the mind of the Pupil. On the contrary, endeavour is made that the Pupil shall clearly understand what is taught, by clear and ample explanation and visible illustration by diagrams, together with a searching examination by such questions as calculated to exercise the conceptive faculty. The Holy Scriptures are frequently read, and the leading doctrines of Christianity inculcated without reference to sect or denomination. A register is kept of the attendance, employment, and general conduct of the Pupils, of which their parents receive periodical reports, and prizes are awarded to deserving Pupils at the end of the year." In the 1861 census George, by now aged 33, listed his profession as 'Private Schoolmaster (English)'. He was living in Peter Street with his 59-year-old dressmaker mother Lucy. In the spring of 1864 at Weymouth George married Sarah Sampson Symes (1830-1902), the daughter of Robert Symes (b1792) of Creech St Michael and Elizabeth Frances née Sampson (1788-1869). In the 1871 census George and Sarah were living in the first house in Wyndham Street, immediately next door to the Elephant & Castle, with three children; Lucy aged 5, Sydney aged 3 and Ada Fanny aged 2, together with the general servant and a lodger. George gave his profession as schoolmaster. In the 1881 census George and Sarah were still living in the house in Wyndham Street but their three children listed in the previous census were not living there (they were presumably at boarding school) however their new daughter, nine-year-old Alice, was living with them. George still listed his profession as schoolmaster. 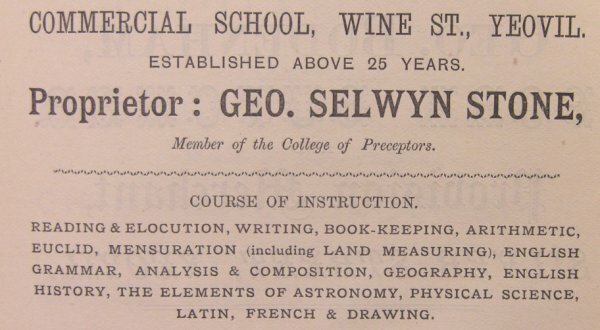 It would appear that George Selwyn Stone's Commercial School in Wine Street closed during the 1880s, having been established for over 25 years, since by the time of the 1891 census George was no longer teaching. Now aged 63 he listed his profession as 'Assurance & Commission Agent' with Sarah listed as his assistant. They were still living with Alice, now aged 19 and a milliner, next door to the Elephant & Castle. In the 1901 census George and Sarah, together with daughter Elizabeth and two boarders, were listed living in The Avenue. George listed his profession as 'Life & Fire Assurance Agent'. Sarah died in the spring of 1902 aged 71 and in the 1911 census 82-year-old George was boarding at 26 Brunswick Street. He gave his occupation as 'Schoolmaster (Retired)'. George Selwyn Stone died in the summer of 1913, aged 86. An advertisement for George Stone's Commercial School from the 1882 edition of Whitby's Yeovil Almanack Advertiser.